Michael McQueen is an Australian author, speaker, social researcher and a commentator on TV and radio programs. In December 2014, I was a guest speaker at the national Financial Planners Association conference in Adelaide where McQueen kicked off the opening keynote with his topic ‘Winning the Battle for Relevance’. He delivered a cracker presentation, that was totally captivating and really resonated with the 2000 plus crowd. Chatting with Michael afterwards, I immediately purchased and read his book and given the power and the currency of his message, I decided to review ‘Winning the Battle for Relevance’ for this edition of Proteuslife. McQueen’s key message for leaders and organisations is to stop and squarely look at their number one challenge – how are you going to win the battle for relevance? The big question we need to answer is; what if you were becoming obsolete – and didn’t even know? The challenge he argues for many leaders and businesses, is that they are so busy keeping their ‘planes on autopilot’ and if they don’t wake up and make the key changes required – they will fly into the side of a mountain! Why, because we are now living and working in unprecedented times of upheaval, change with radical disruptive shifts in business and organisations. Market structures and distribution channels are disintegrating before our eyes. Once secure and lucrative revenue models are under siege and what worked yesterday will more than likely not work ever again, today or into the future! No company, brand, or leader is immune from becoming extinct in this age of digital disruption. “The dizzying pace of change in recent years has left many business leaders feeling disorientated and out of control”. McQueen’s book helps the reader to separate the ‘endangered from the enduring’, by firstly giving a roadmap as to where your organisation, product or service is on the lifecycle of the ‘relevance curve’. Depending where you are on the relevance curve determines whether you are either trying to retain or regain your position of relevance. We then need to know if we are on the emergence, prominence, irrelevance and finally obsolescence path and what to do about it. McQueen then shares with the reader ‘The 5 Roads to Irrelevance’, that when unheeded will contribute to the demise or obsolescence of businesses, brands and even leaders with great ideas. This includes many iconic but tragic case studies such as Kodak, Borders, HMV Music and many more. These failures are breathtaking when read in hindsight, however the power of decoding their stories of becoming obsolete, helps us to reinforce why we need to embrace change and be eternally vigilant of complacency in this age of radical disruption. Shift Happens – we need to account for the five big shifts of societal, demographic, market, technological and legislative change that threaten our brand or organisation. The Intoxication of Success – become aware of the four symptoms of complacency, conceit, closed-mindedness and conformity. Preservation Obsession – the need to acknowledge the symptoms of glorification of the past, over-emphasizing process and stubborn fixation on traditions. Progress Addiction – beware of the ‘dark side’ of innovation, such as unbridled pursuit of growth and moving away from your core DNA. The Human Factor – acknowledging that human traits are often one of denial, short sightedness and poor judgement – humans are far from logical. McQueen then finishes his book in an upbeat and positive way, by looking at the six strategies for achieving enduring ‘viability and vitality’, by what he describes as ‘decoding tomorrow’s workforce’. 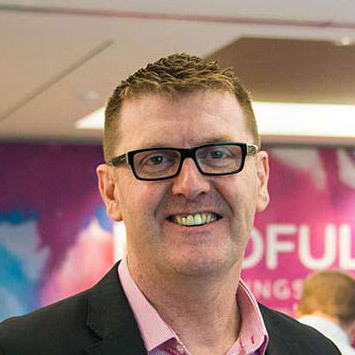 He argues convincingly, that if we re-calibrate, re-focus, re-fresh, re-engineer, re-frame and re-position, we will have a greater chance of regaining and or remaining relevant as a brand, as an organisation and as a leader and in turn we can avoid the pitfalls of becoming obsolete and irrelevant. McQueen shares some great case studies of many enduring companies like the iconic Lego, Swatch, Volvo, etc. that continually reinvent themselves and who, to date, have successfully navigated change. The extra bonus is that when they do so, they actually emerge from this transformation and upheaval, even stronger than ever. 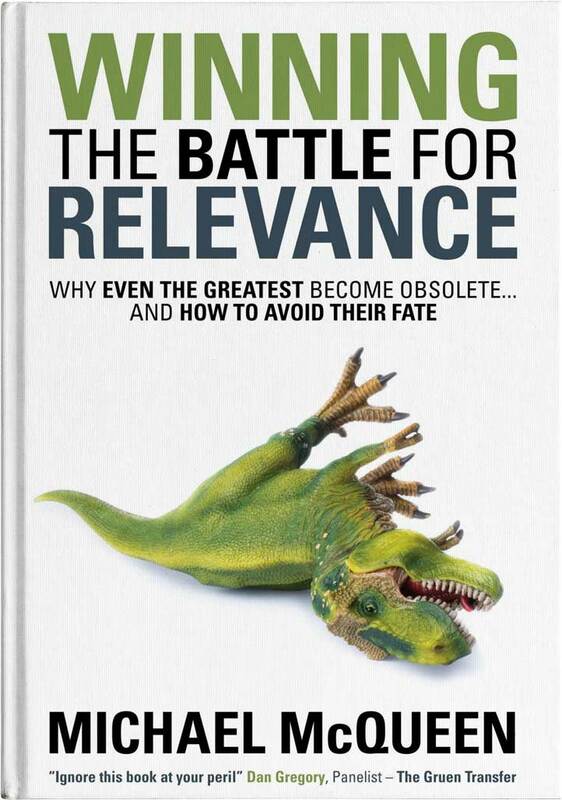 I highly recommend reading ‘Winning the Battle for Relevance’. It is well crafted, compelling and a greatly researched book and has so many powerful case studies to highlight what to do and what not to do as leaders facing one of the most critical and challenging issues – how do we stay relevant and not become obsolete in a digital age of radical disruption?